The amazing PMP2000D Powered Mixer packs 2,000 Watts of high-efficiency Class-D output power, while maintaining an incredible power-to-weight ratio. With 14 available input channels, the PMP2000D features 9 of our premium-grade "Invisible" IMP mic preamps with switchable +48 V phantom power, 4 stereo channels, an ultra-high quality KLARK TEKNIK FX processor with 25 presets including studio-class reverbs, delays, pitch shifter and various multi-effects - and dual 9-band stereo graphic EQs. Top it all off with "Wireless-ready" operation, thanks to our high-quality ULM digital wireless microphones (sold separately), and the PMP2000D is the ideal, easy to use, and ready for anything live sound solution! 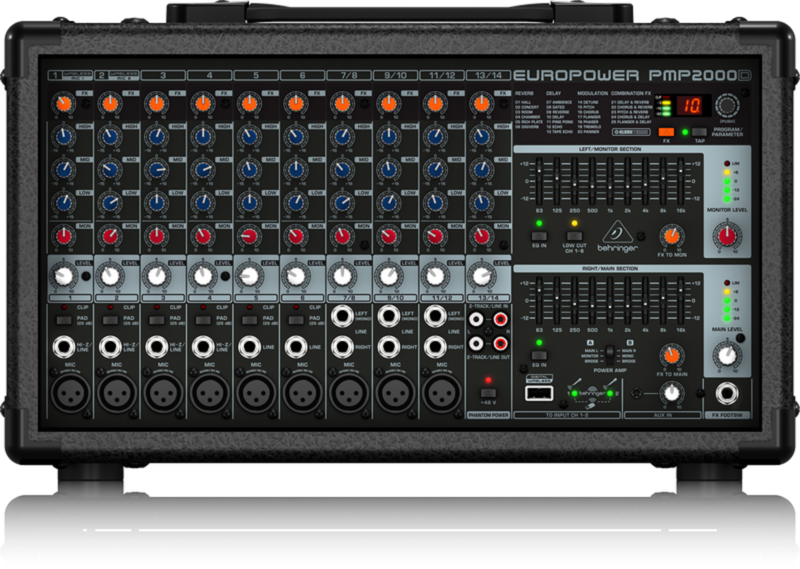 The EUROPOWER PMP2000D`s six mono inputs (plus 3 of the 4 stereo channels) feature our ultra-low noise, high-headroom IMP "Invisible" mic preamps, which have been praised by audio professionals all over the world. These studio-grade mic preamps off er a staggering 130 dB of dynamic range, with a bandwidth that extends from below 10 Hz to over 200 kHz, and are perfectly matched to every conceivable microphone - with up to 60 dB gain and a +48 V phantom power supply. Armed with these superb mic preamps, the PMP2000D provides exceptionally-transparent and crystal-clear sonic performance - making it the ideal choice for both live sound and studio recording applications. KLARK TEKNIK is recognized worldwide as one of the most prestigious British audio companies, with a 40-year pedigree and even a TEC Lifetime Achievement Award to back it up. The Company has designed and manufactured products for world-class artists, and their legendary DN780 reverb processor is considered by leading audio engineers around the world as the industry standard. Check out their website to learn more about KLARK TEKNIK`s legendary heritage.